One small customer insight can lead to millions in extra sales, according to Joe Urbany, professor of marketing at the University of Notre Dame, who spoke at the ADMA Global Forum today. Urbany, who works with local company, Choice to Growth, and is the co-founder of Vennli, said there is a misalignment between what companies think their customers want, and what they actually want. And it's those gaps that represent financial value. Closing the gaps can have enormous implications for the financial bottom line of a company. But to do that, organisations have to be brave and be willing to hear things from their customers they may not want to hear. “The misalignment between what customer wants and what a business thinks they want is huge. Our research shows most companies only have about 48 per cent of alignment with their customers,” Urbany told CMO. 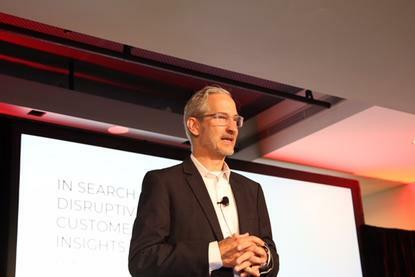 Urbany said the issue is companies being willing to action disruptive insights, because companies are sensitive about putting their customer theories to the test. “There’s never any disruption without an insight about customers and customer decision making,” he said. “Customer choice completely determines your financials. So how do we understand customers’ decision making? I gave my students a project around understanding the central nature of customer choice. Urbany said he's repeatedly found that when executives hear evidence of something they didn’t know, or that they have lower value to their customers than they thought, they are disruptive in a positive way because there’s motivation to do something about it. In other words, disruption is an insight that has direct action implication. So how do businesses get to the disruptive insights? Urbany said asking a customer flat out what they want is the worst question a company can ask. “Instead, get customers to articulate why they made their choice, and what they value in that choice. Why would they choose your business over someone else? Conversely, why would they choose a competitor over you?" he advised. “Never ask customers ‘what they want’, because they can’t really articulate new things from that question. What you do is ask them why those factors are important to them. We all know there’s ‘Five Whys’ to get to root cause analysis, this is also called laddering. It aims to get to the deepest human values and that’s what drives behaviour. Laddering helps you get into unmet needs of your customers." Urbany said the hardest thing is getting really narrow and limiting yourself. "Start with just a few conversations. Ask your customers about your competitors, and when they are choosing between businesses, what’s the main reason they do so? How can we improve? How can the competitor improve? Why are these things important to the customer? “If someone says quality, then ask them what they mean by quality. It only takes 10-15 minutes to get some significant insight you haven’t asked for. This is the simple human value of understanding." Urbany admitted this can feel counter to a sales conversation. "But you sell more from a non-selling conversation, because the customer loves to be understood. In a sales conversation, the customer is immediately on the defensive," he said. After gaining these customer insights, companies need to pay attention to them, appreciate them, socialise them within the organisation, and then action the insights.